If you have a Casio DH 100, and it squeaks ( click on the link to hear it ) when you are trying to use it, it is possible that it can be easily fixed. I bought my niece's from Best Buy when they discontinued the product about 10 years ago for $35 US. It wasn't to much money, but when it finally broke I realized how expensive it was if I had to replace it. 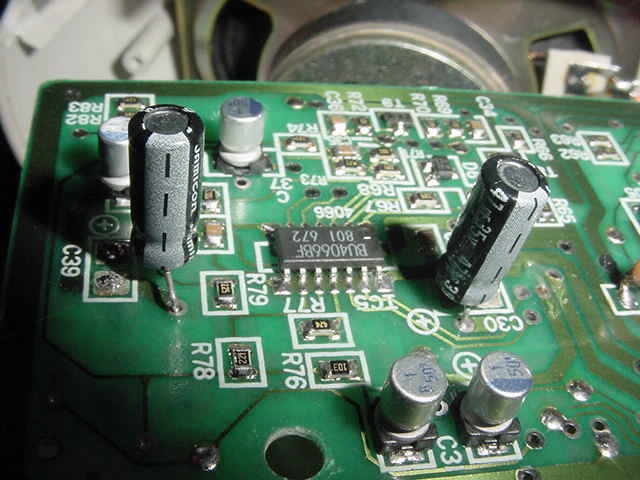 I took it apart and I found two leaky Capacitor on the surface mount board. The small caps C30 and C39 were noticeable since they had corrosion from the electrolyte leakage under the plastic base. If you wiggle it carefully, the corroded caps will brake off. If it's not braking try to cut it off by using a small wire cutter, or use a soldering iron. Take a soldering iron and clean of the pads that the caps were soldered to, and wash the corrosion of with some alcohol. The board has holes already drilled, for the through hole capacitors. If you are going to use a polarized cap, make sure you install it correctly. Push the capacitor legs throw the hole, till the cap is almost touching the board. You might have to bend open the legs to have a better fit. Make sure that the legs are not making a short circuit. I used two electrolytic 47uF caps (part number 272-1027 ) from Radio Shack that went for 99 cents each, you might be able to see it from the picture. Other type of caps like the ceramic or tantalum will work as well, and might have a longer life than the electrolytic caps . After soldering the caps, my horn worked as good as it did new.